Click the links below to view the video stories of our Cardiac Screening Evening hosted at Arcadia High School in honor of Shania Singer, age 15, that died Oct. 31, 2015 from SCA. TV3 and CBS5 aired our story. Friday, January 29, 2016. Click the link below to read the story and watch the video of Sharon Bates and Jessica Hermann, ABF representativesat the Phoenix Suns game, Friday, January 8, 2016, winning the 2016 Phoenix Suns Charity Challenge of 2016. Click on the link below for the news story in Glendale AZ on Your West Valley, Sept. 19, 2015, related to our Willow Canyon High School screening day, efforts in Peoria, plus the new direction of the Anthony Bates Foundation. Click to listen to the "PSA Show with guest Sharon Bates." - hostesss Athena Sanchez on Riveria Broadcasting Stations. Click to view the "Pay it Forward" News stor of Sharon Bates. -"Arizona mom saving lives in son's honor"
Click to view the "Rally for Red" News story of Shellie Wenhold. She makes a difference in AED & CPR training needs by sharing Jonathan's story of Sudden Cardiac Arrest when he was 9 years old. - "Mother takes action after son's sudden cardiac arrest." 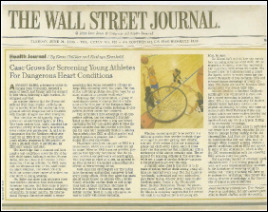 Click the link to read about two Moms (Sharon Bates & Shellie Wenhold) banning together regarding Cardiac Screening in Youth & AEDs in Schools - "Foundation focuses heart screenings on Peoria Unified schools"
"Call for better screenings for young athletes"
"MOMster Monday - Sudden Cardiac Arrest"
"Death of a football player spurs mom to save other student-athletes"
MANHATTAN - Defensive tackle Anthony Bates had completed his workout at K-State's football weight room and was driving on Denison Avenue heading home for lunch. 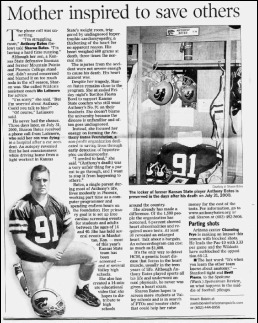 He never made it due to a genetic sudden cardiac arrest in 2000. GLENDALE - A 16-year-old athlete at a Michigan high school has died after suffering a cardiac arrest from an enlarged heart. It's a sad story -- one that a valley family lived through 10 years ago. Sharon Bates lost her son, a star athlete, almost the same way. 20-year-old Anthony Bates played football and went into cardiac arrest one day. He collapsed and died. (Courtesy Missouri Western State University) On Sunday, September 26th the MWSU Athletic Department, Heartland Foundation, St. Joe Sports and the Anthony Bates Foundation are partnering to bring the 1st Annual Anthony Bates Foundation Cardiac Screening to the campus of Missouri Western State University. The screening is available to all Missouri Western Student-Athletes, middle school and high school athletes in the surrounding areas. 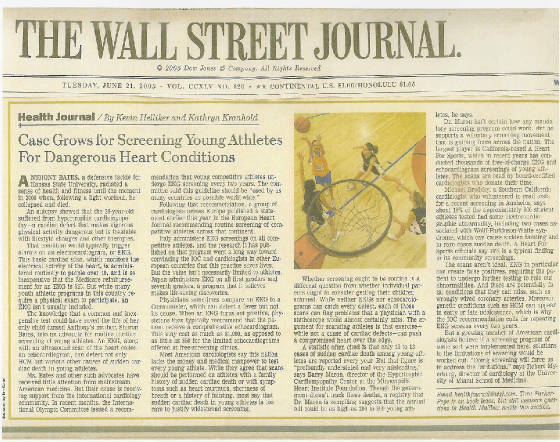 Is It Safe for Students to Play Sports Without Heart Exams? TUCSON, AZ (KOLD) - A free heart screening was held Saturday at Salpointe Catholic High School Organizers hope it helps save local lives.The Anthony Bates Foundation and the Carondelet Health. Network teamed to offer free screenings to children from 12 years old, all the way up to 22. Paula Boivin reports from Phoenix, AZ to all Arizona communities, for the Arizona Republic Newspaper. Kansas State University Football gets ready for another Fiesta Bowl game without Anthony Bates, #91.